Today is Food Revolution Day! For those of you who don’t know, Jamie Oliver, a British chef and TV personality, is a huge advocate for bringing cooking and natural foods back into our homes and in our schools. Through his TV shows and books, he’s been pushing a “food revolution” trying to convince people all over the world to get involved in their food consumption and to stop eating processed foods. What it means is to understand where your food is coming from, how it is grown or raised, and to start cooking your own meals using fresh ingredients. He’s been working really hard to bring better food into public schools in the UK and also came over to the States, but was a little less successful here as you can imagine. Besides all this, his food is REALLY good. The first meal I ever ate that Jesse had made was his recipe for a butternut squash, Bolognese lasagna with fresh mozzarella. It was incredible. So today is Food Revolution Day, a day where people all around the globe are coming together to advocate for healthier foods and healthier people. 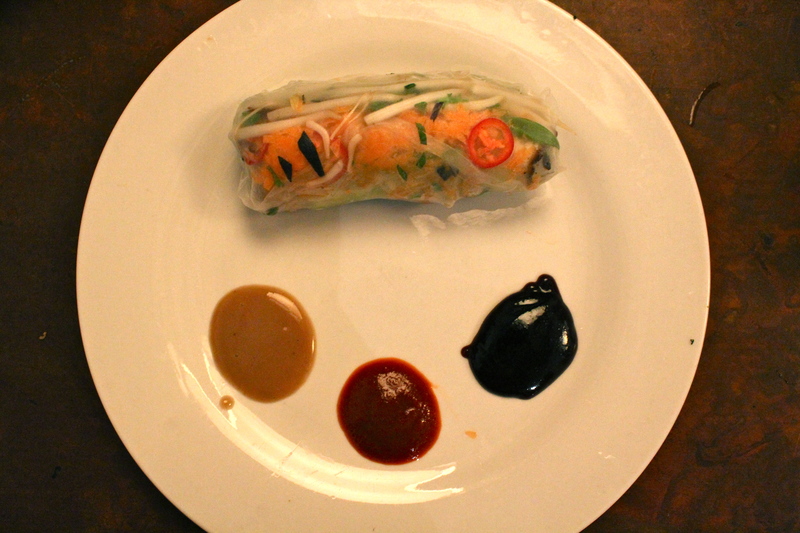 As I am also an advocate for this, I thought I would contribute a little something to the day with one of our favorites: thai/vietnamese spring rolls. They are a wonderfully light but really satisfying summer dish and are pretty low impact on the cooking. Mainly a bunch of chopping. The hardest part about this is the trip to the asian supermarket, but really, is that hard? The best part about them, is that they can be whatever you want them to be. Use any kind of protein, any kind of veggies, any kind of noodles, any combo of herbs. It’s an asian burrito and you can put whatever you want in them! (Just don’t put too too much or else you won’t be able to close your burrito. Trust me, I know…) This is how I make them, but again the ingredient list is very flexible. 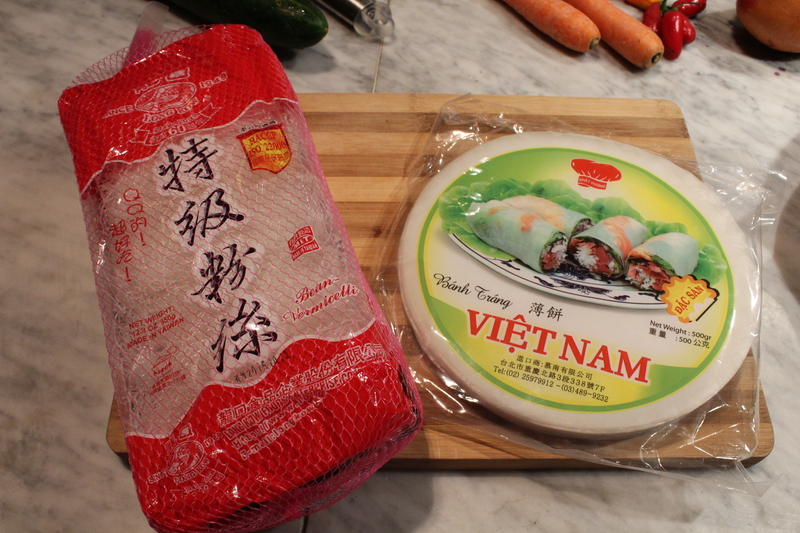 The more traditional vietnamese rolls have shrimp in them. Really yummy. You could also use mushrooms, chicken, beef, pork, whatever. Radishes, lettuce, cabbage would all be really good additions too. Just try to keep it light and, well, springy. *I realize these don’t have quantities next to them. It really depends on how much you’re making. I kind of chop up a bunch of stuff and then make as many as I can with that. With what I chopped up, you’ll see below, I was able to make about 9 full rolls. Bean thread on the left, rice paper on the right. Bean thread is also called vermicelli sometimes. 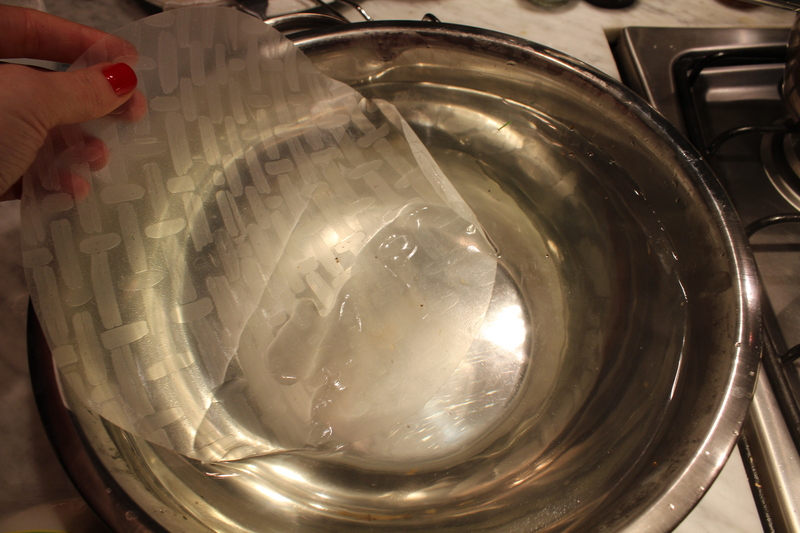 For the rice paper, try to find a one that is a little thicker. The package will preferably not have broken pieces. If it does, it’s probably a lot thinner and will be a lot harder to work with. Unfortunately, you might not have a choice. 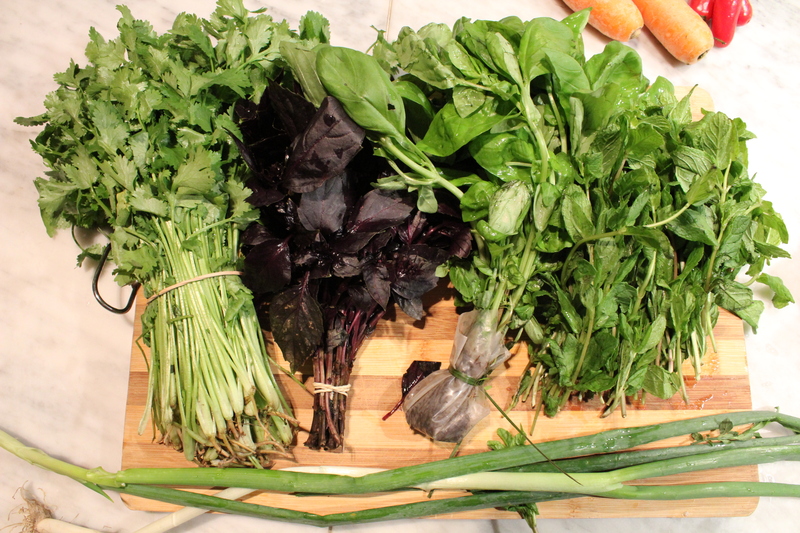 Cilantro, purple basil, common basil, mint, green onions (scallions). Rinse them off and dry them. Again, if you don’t like some of these herbs, or any of them, just take them out. It’s not going to ruin it. 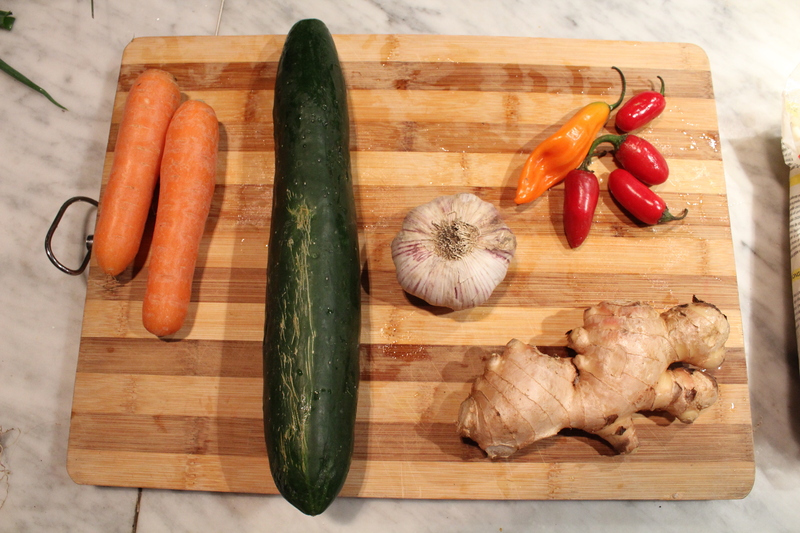 Carrots, cucumber, garlic, peppers, ginger. I don’t remember the name of these peppers. They are kind of medium hot. Normally we would use bird’s eye chili, which are super hot, but you could also use jalapeños or nothing at all. I didn’t use all of these. I forgot to take a picture of all the sauces I used at the time, but had this picture from when I went to Barrio Chino. 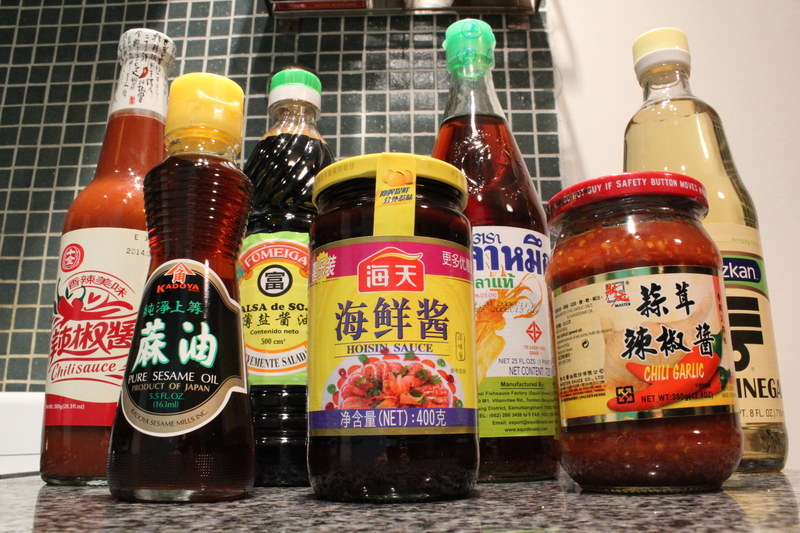 You have here, in the front, the pure sesame oil and hoisin sauce and in the back the soy sauce and rice wine vinegar (on the right). For the tofu, you first have to get the water out of it. Wrap it in a kitchen towel and then let something really heavy rest on top for about 30 minutes. 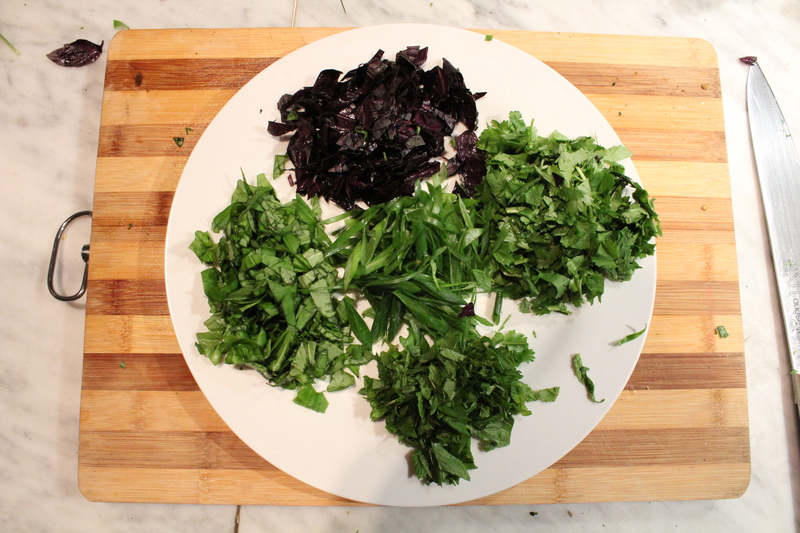 While you’re doing that you can start chopping and mixing other ingredients. 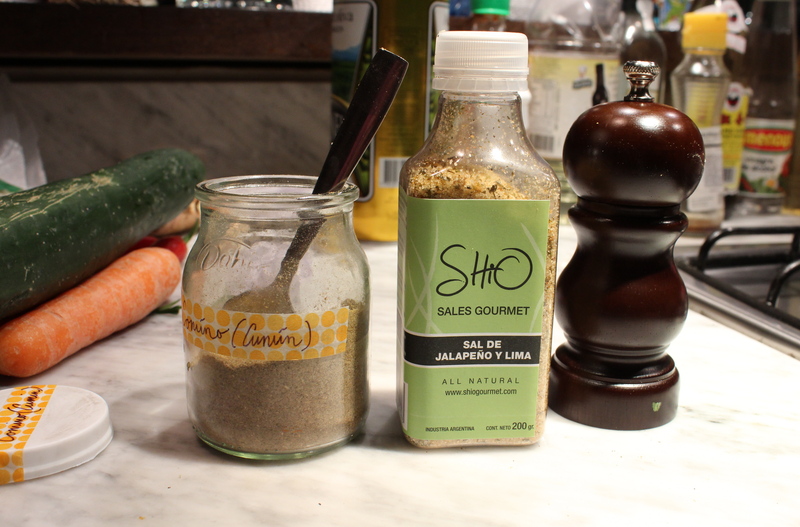 You can really use whatever spices you want or just use salt and pepper. Tofu is kind of like white rice in that it doesn’t have a strong flavor on its own so whatever you want to use really won’t clash with it. Have fun. Experiment with different flavor combinations. I usually mix the seasonings on a plate or large bowl first. 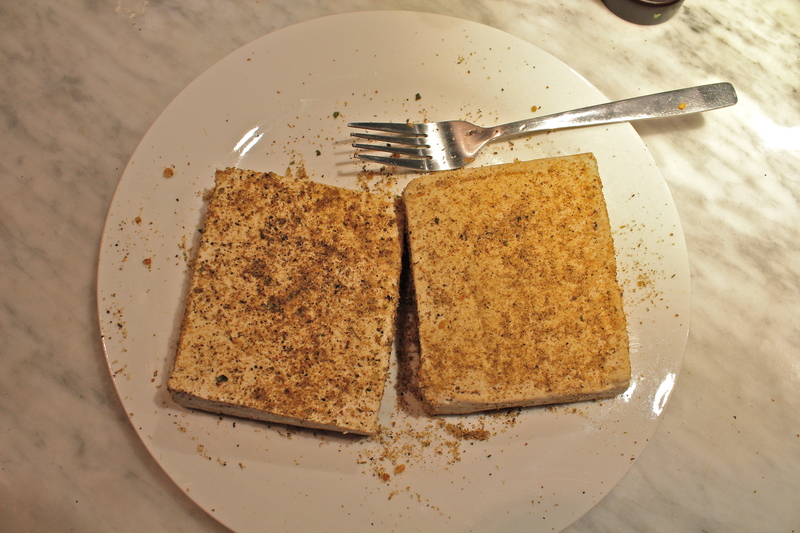 Cut the tofu in half to make it a bit thinner and then cover in your seasoning of choice. 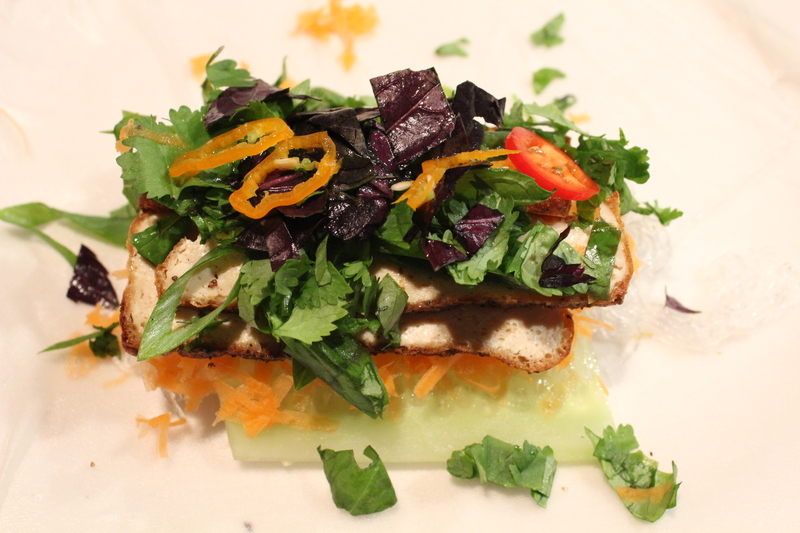 Pour 1/2-3/4″ of vegetable oil in the pan, so that the tofu is about half submerged, and heat on medium high heat. 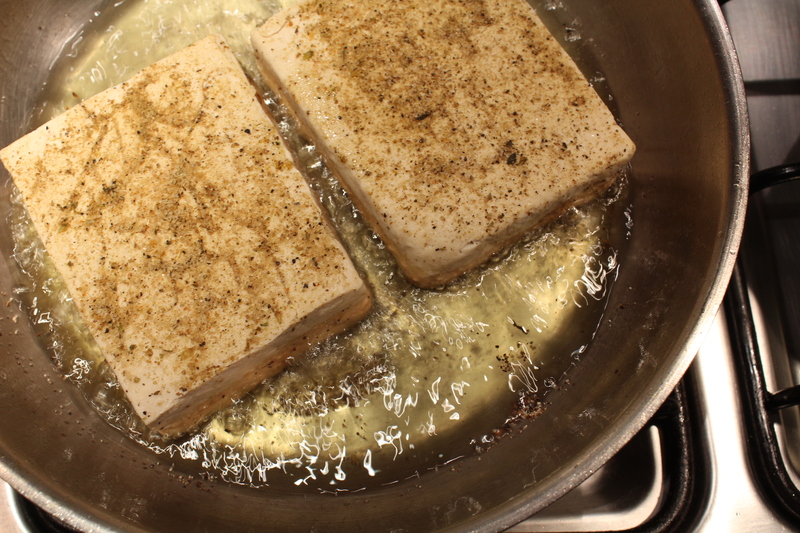 Once the oil is hot enough, carefully place tofu in pan and cook until a dark golden brown. Try not to move it around while its cooking. Carefully flip the tofu and cook on the other side until a dark golden brown. About 4-5 minutes per side. Place them on a paper towel when finished cooking to cool for a minute. Bean thread. Each bag of bean thread is comprised of smaller packets. Each packet is about one serving. I used 3 here and had some left over. Put a large pot of water to boil for the bean thread. They take only about 3-4 minutes to cook through all the way. You can do this ahead of time, pour them in a colander and then run cool water over them to stop the cooking process. 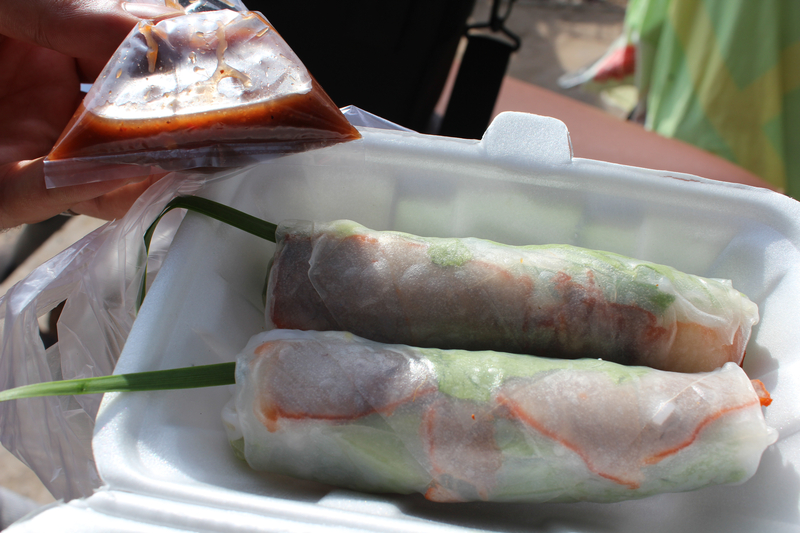 The spring rolls are cold or room temperature so you can just let them sit there. They will get really sticky and cling together. Not a big deal and no way to stop this. When you’re ready to use them, you just have to dig in with your fingers and rip out a chunk. This is technically a dumpling sauce, but is really one of my favorit things ever. I could drink it. Maybe I have. This is the version as I know it. This is to make this full bowl of sauce. We didn’t use it all and saved the rest for future meals. As with many things, it only gets better the longer it sits. For the ginger, I used about half the knob from the picture above and about 4 cloves of garlic. 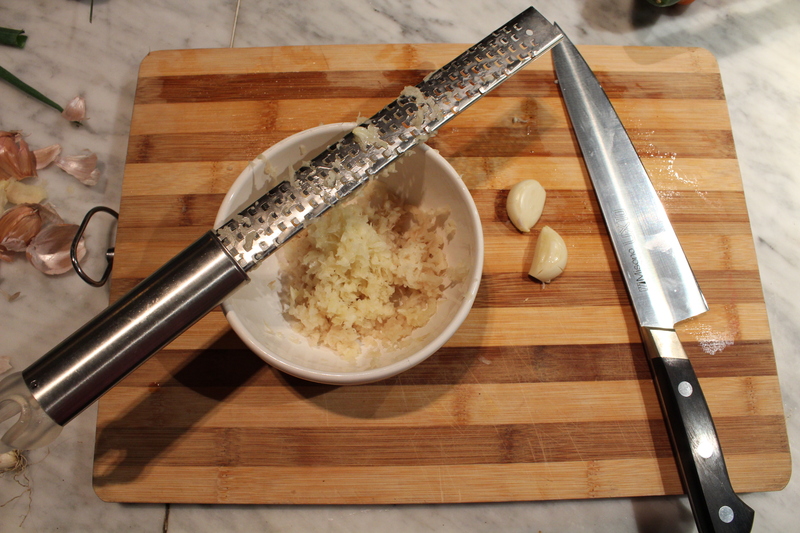 Peel the ginger and garlic and use a microplane to grate both into the bowl. If you don’t have a microplane you can also mince the ginger and garlic very finely. 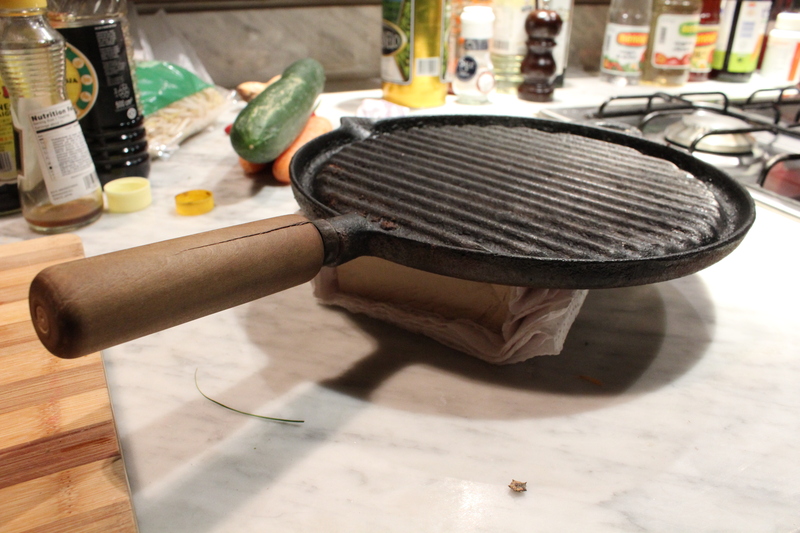 The benefit to the microplane is that it extracts more of the juices. Remove the seeds and thinly slice one pepper, if you like. Add soy sauce and black vinegar in equal parts, a couple splashes of rice wine vinegar, and juice from half a lime. Mix well. Then add just a little dribble of sesame oil while still stirring vigorously. You can add more or less of each one to taste. Just keep in mind the sesame oil is very strong and a little goes a long way. Set aside to “marinate” a bit. Peel the cucumber and cut into long strips. Peel and microplane your carrots. 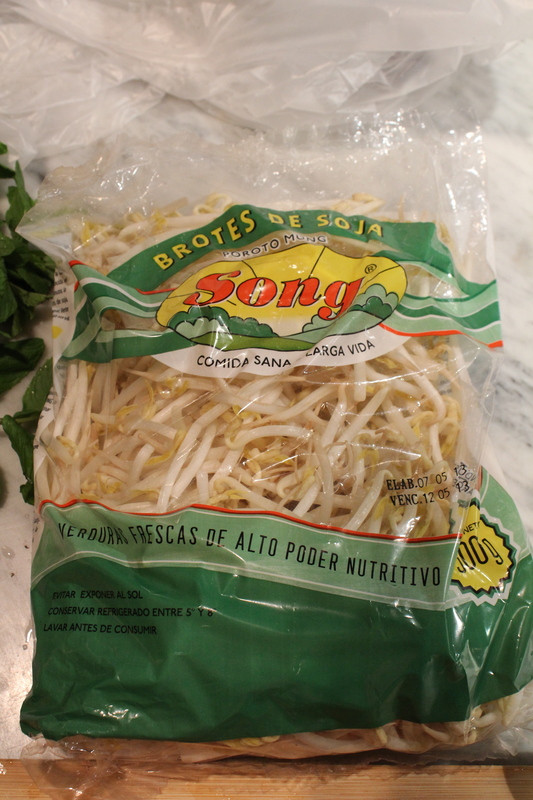 Bean sprouts are good as is. Remove the seeds and thinly slice the pepers. 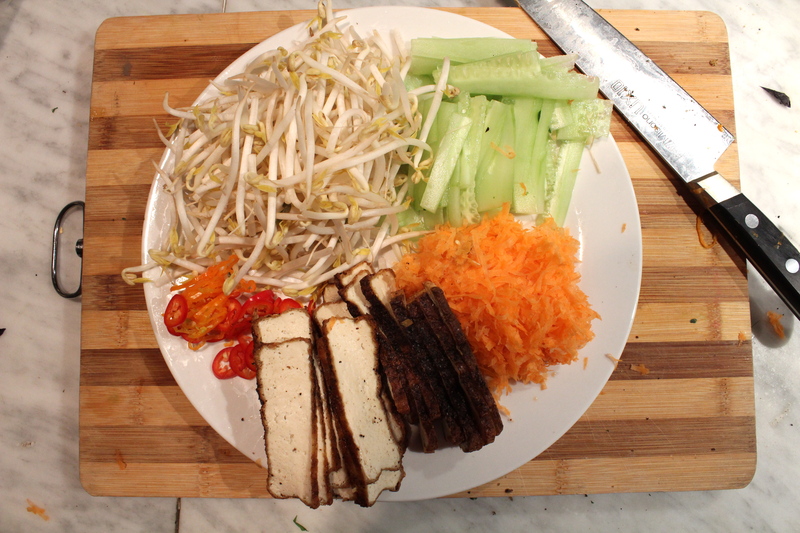 Thinly slice your tofu. You want everything to be pretty thin and delicate. Easy to bite through. *You can also choose to have everyone make their own roll, which is also fun, that way people can customize their roll and it cuts down on the work you have to do. Just put all the components out with a warm bowl of water. First, grab a refreshing beverage. 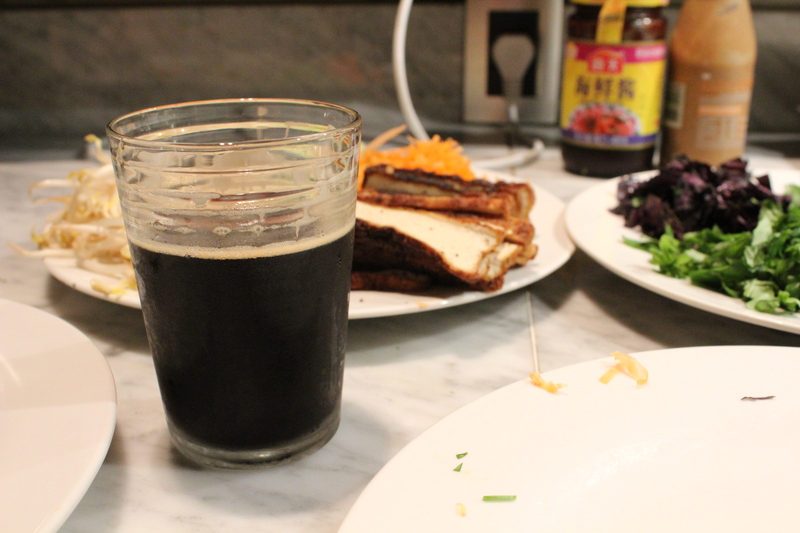 I have a nice Argentine dark stout here. Then make sure all the ingredients are within arms reach. 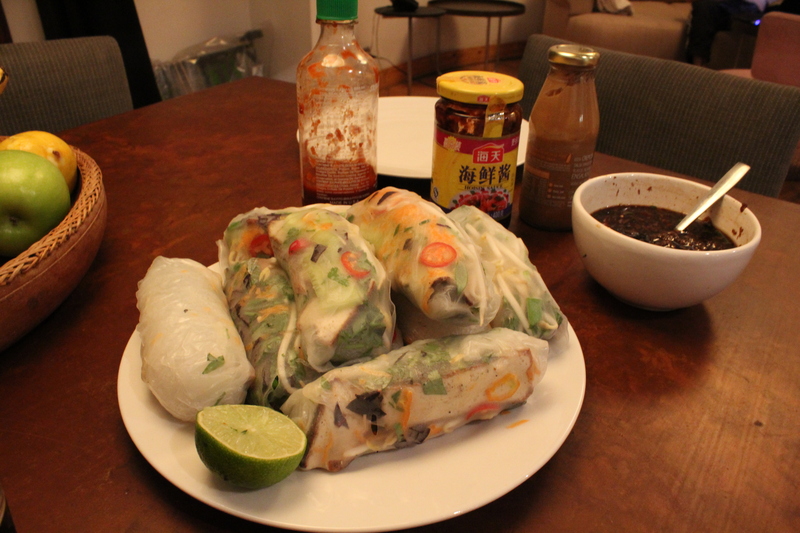 You are setting up your own little spring roll factory line. Get a large bowl and fill with hot water. I boil water and then add warm water to cool it down a little. Just make sure your skin can handle the temperature. Slowly add the rice paper to it. 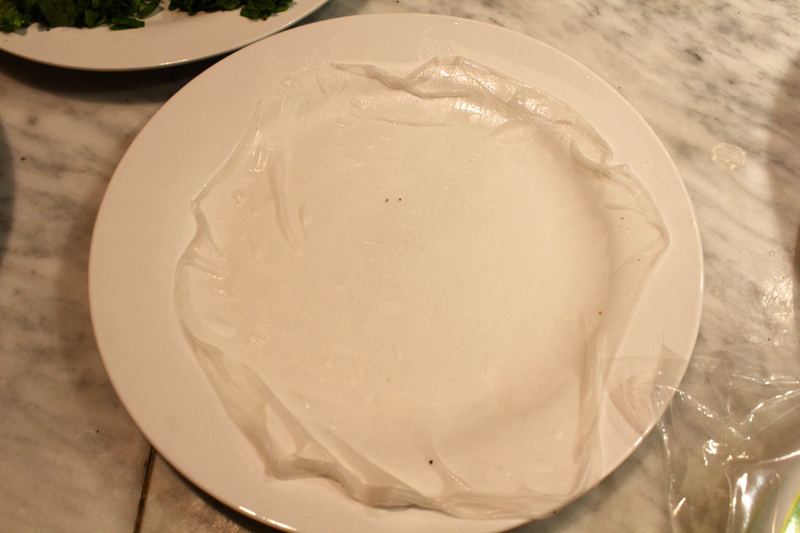 You are softening the rice paper. But this also makes it really sticky and delicate. Try not to let the paper fold over on itself. Think saran wrap. This is why thicker paper is better. It might take a couple times to get the hang of it. As you remove it, try to keep the circular shape. Lay it on a clean plate and then you can start filling. 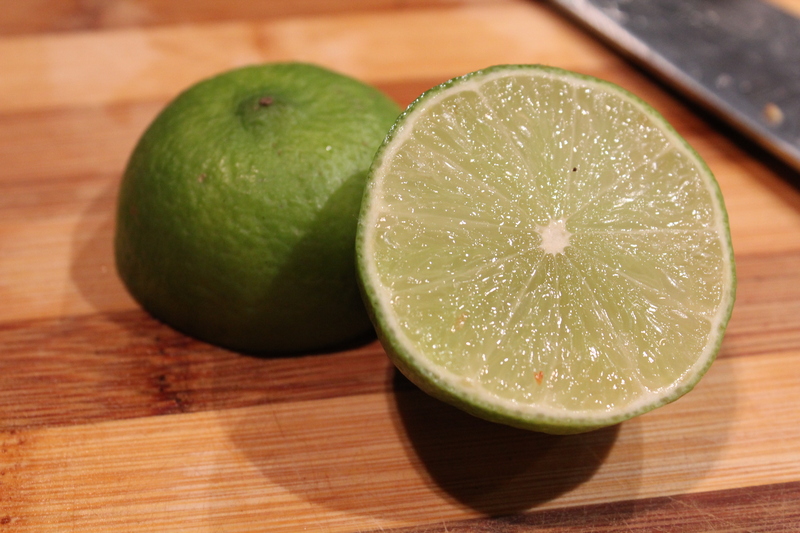 Fill them up any way you like and add a squirt or two of lime juice. Carefully roll it up like a burrito: fold over the top pulling the ingredients in, roll, wrap the sides in, finish the roll, securing everything in. mmmmmmmmmm. You can make these ahead of time and refrigerate them too. Just put them in a tupperware with some damp paper towels between each layer so they don’t stick to each other and also so they don’t dry out too much, otherwise the rice paper will get a little dry and stale feeling. 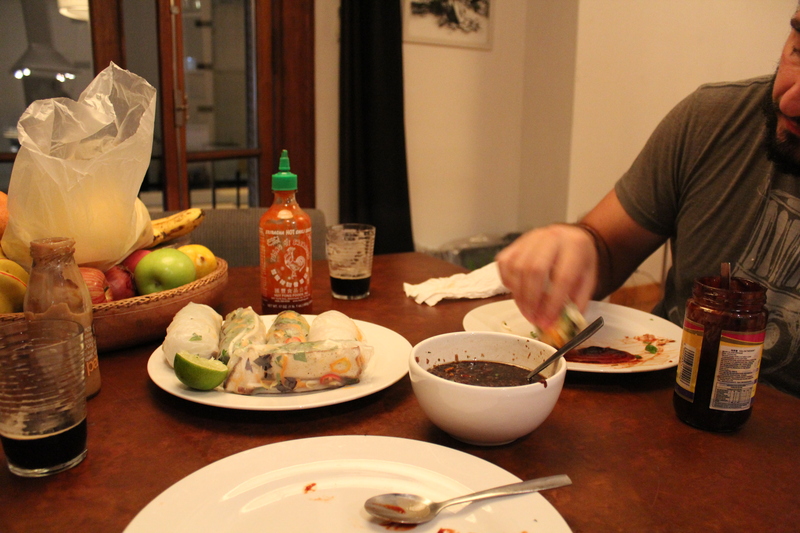 Much prettier pork spring rolls in Vietnam with hot sauce!